Every idea doesn't have to have wide ranging impacts ... i would welcome some things '"just for fun" and could be short lived. Now before we jump on "no I don't want time spent on anything until my fav idea is completed" what I am suggesting is very simple stuff no harder than say swapping the skins on mobs for certain holidays. -Put a skin on a tree with a silly face carved in for us to find. -Put a "Kilroy was here" kinda message on an old ruin in PR. -Put B52's haircuts at the hair stylist for a few weeks. Miniscule time investment but it would put a smile on players faces now and then and we could vote for best prank with prizes for the staff member that does the implementation. This will work only for OCC events, I don't think this will be approved by lore team. btw, what B52's haircut? Who is Kilroy? Wants!!!!!!!!!!!! Just take my damn dapper and gimme!!!!!!!!!!!! "The band's name comes from a particular beehive hairdo resembling the nose cone of the aircraft of the same name." 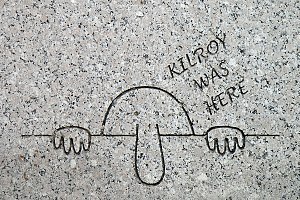 "Kilroy" was the American equivalent of the Australian Foo was here which originated during World War I and later became popular among school children. "Mr Chad" or just "Chad" was the version that became popular in the United Kingdom. The character of Chad may have been derived from a British cartoonist in 1938, possibly pre-dating "Kilroy was here". Etymologist Dave Wilton says, "Some time during the war, Chad and Kilroy met, and in the spirit of Allied unity merged, with the British drawing appearing over the American phrase." Other names for the character include Smoe, Clem, Flywheel, Private Snoops, Overby, The Jeep (as both characters had sizable noses), and Sapo." Nah ... w enever take dapper ... 1st one is yours. Those Teeth look scarier than a kincher!